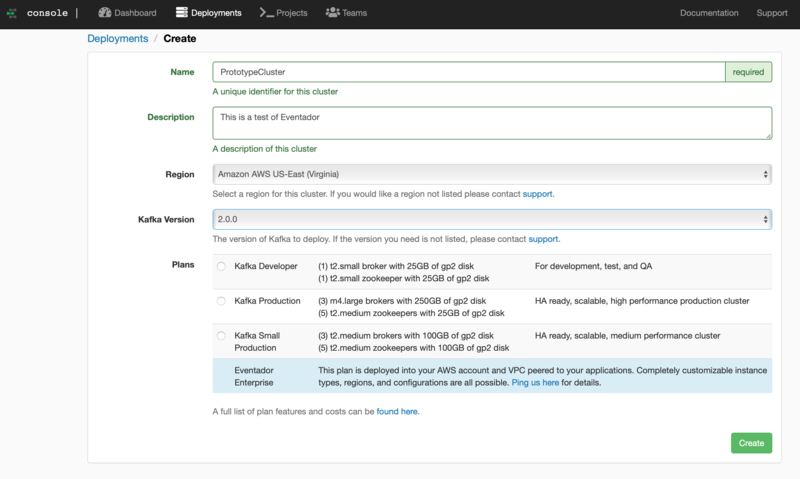 Eventador has publicly available Fully Managed Kafka that you can try out to get a feeling for how Eventador works or build entire production Kafka clusters. This is called the Instant-On environment. If you don't already have an account, create one. Otherwise login and skip this step. Create an account or register via GitHub. A deployment is all the components needed to run Apache Kafka. The zookeeper cluster, the Apache Kafka cluster, network rules, monitoring and stats gathering, access control management, etc. All assets are dedicated and in a unique VPC. Name the deployment. For this example we will use the name PrototypeCluster. Click Create. This step is required for all non enterprise deployments. You will need to add an ACL allow rule for access to your new cluster, all clusters are DENY ALL by default. ACL's are deployment specific. From the deployments list - Click the security button to add an ACL for your deployment. Add an IP range you would like to open in CIDR notation. Here are a few examples of possible ACL entries and their outcomes. If you have any questions or are unsure of what to allow, feel free to contact Support. periodically. One such example is users on Heroku. the correct CIDR block (/NN) (where N denotes a number). NOTE: We highly recommend using SSL connections especially with the Instant-On plans. You have setup a new Apache Kafka cluster. Now that your topic is created you’re ready to start sending data. Here is an example of producing and consuming data from your Apache Kafka deployment with Kafkacat.